What a deliciously scary, spooky week this is turning out to be. Horrible Halloween, X Factor on the telly, Murderdolls' singer's tickets on the loose, Fireworks night. Wait a minute - did I mention Murderdolls somewhere in that sentence? I certainly did. No Halloween week would be complete without a spot of theatre and let's face it, Alice Cooper can't do it all on his own and Marilyn Manson is too busy on holiday in the Tropics getting a tan (possibly). So, we welcome back the dulcet tones of Wednesday 13, the macabre horror-rock schlock-terror non-de-plume of Murderdolls' frontman Joseph Poole. Hey kids, don't be (too) scared, he's fine once you get know him. And getting to know him is something a very large legion of fans has done in recent years. Never mind the trio of cult-selling albums such as "Right to Remain Violent" and "Women and Children last", Poole's, sorry, Wednesday 13's solo work is more bounteous and prolific, not forgetting a tad tongue-in-cheek when it comes to titles. "Fang Bang", "Transylvania 90210" and "Calling All Corpses" suggest a sense of humour and an understanding of parody, not least a love of cheap zombie flicks and a dose of Bela Lugosi on a Sunday afternoon. The horror continues next year when Mr 13 gets around to releasing a follow-up to 2012's EP "Spook and Destroy". Entitled "The Dixie Dead", you can bet on another full-on assault of garage-tinged cowpunk and grimly fiendish delights - as well as some shows. In the immortal words of their 2008 album, rather than just issue music online, '**** it, he'll do it live'. 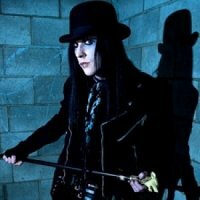 After his Halloween knees-up in Camden last week, Wednesday 13 will return in 2013 for some spring scare-mongering in the form of a tour. First stop is Brighton on 6th March, followed by Bristol, Manchester and more until Islington on the 13th. We'll have tickets on sale from 10am Monday 5th November. Just don't turn up wearing a tracksuit.